Osteria Radici has been named a 2018 James Beard Award Semifinalist for the Best New Restaurant in the country. "In one of Monmouth County’s smallest towns, Randy (the chef) and Ally Forrester have made a big statement about the vibrancy of Italian cooking. The young yet experienced and well-traveled couple’s frequently changing menu features sybaritic pastas like cannelloni with marsala-braised duck, and mains like bone-in lamb with honey-brined olives. Their 24-seat byo is worth seeking out." "Old World Italian cuisine is fairly easy to find in Mercer County, as is Americanized Italian pizza and pasta. 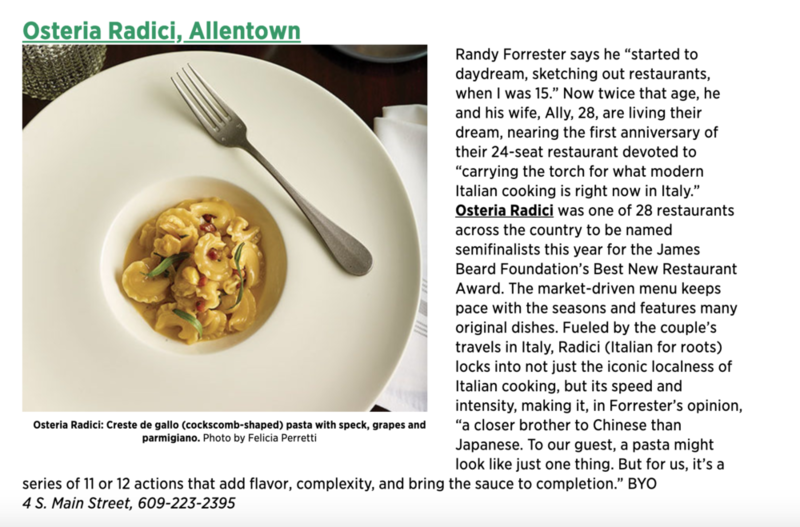 But for contemporary Italian dishes, the place to go is Osteria Radici in Allentown." "Forrester is a knowledgeable and talented chef, and he knows his craft. He deserves praise for pushing the envelope on Italian fare because when he succeeds, as he often does, the winner is the diner." "The Forresters walk their tightrope like pros, starting with a well-edited menu that manages to offer far-ranging flavors as it remains mindful of the seasons. " "...the creation of chef Randy Forrester and Ally Forrester, who are putting this storefront BYO on the map with Italian fare that’s at once sincere and sophisticated, a tribute to the motherland and original, bold and subtle." 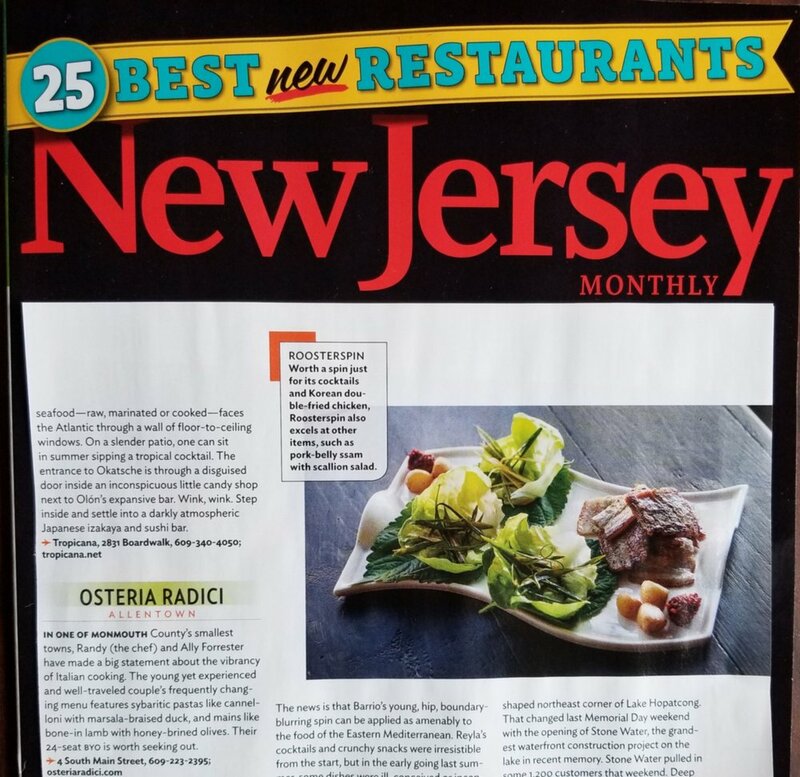 "... the vibe in the dining room is merry, with neighboring tables sharing happy thoughts on what diners here realize is a rare breed in the genre of Italian in New Jersey."